STEP 1: Sign a world-class goalkeeper, capable of stopping Robert Lewandowski one-on-one. AKA Petr Cech. STEP 2: Rally up the team with a “nothing to lose” attitude, by losing first two group games meaning we have to win this one or we’re effectively out. (Circa away legs in Munich in 2013&14 where we won 2-0 and drew 1-1 after poor first legs). STEP 3: Tell the press you’re going to come flying out the blocks from the start to get an early goal. Do the opposite. Leave Bayern and Guardiola surprised by deep-lying defensive tactics. STEP 4: Play only the counter attack. Surrender possession. Defend as a team. STEP 5: Turn Coquelin to fully passionate and determined. Allow for big challenges, shouting at team-mates, keeping everyone organised, and celebrating like a fan. STEP 6: Make religious 70th minute substitution where Walcott and Giroud swap places. STEP 7: Put all the big guys in the box and sneak a cheeky winner. STEP 8: Score. With any part of the body. Doesn’t matter how they come. I always rated Giroud. STEP 9: Keep a clean sheet. STEP 10: Remind Bellerin he is faster than Douglas Costa. And Alaba. And everyone else on the pitch for that matter. STEP 11: Get Ozil another goal in another big game. STEP 12: Be the first manager to have beaten both Pep Guaridola’s Barcelona and Bayern Munich. Who could Arsenal face in the Champions League? The Champions League group stage draw is set to take place tomorrow, Thursday 27th August, at 4:45pm (UK time), in Monaco, where Arsenal find themselves in Pot 2 with the potential to be drawn in one of their toughest groups to date. So now you know all the details, but where can you watch it? Sky Sports News of course. OR you could just read your twitter feed and the endless people tweeting updates in real-time. Unfortunately due to the changes made by UEFA, Arsenal will be in Pot 2 this year for the first time in a while. As will fellow English sides, Manchester City and Manchester United (should they beat Club Brugge tonight). This comes down to the regulation changes that have been made to the draw to benefit each association’s “Champions”. The new regulations take into consideration the clubs domestic form instead of European, as it used to be, much to the annoyance of Wenger, who has consistency of getting to the knockout stages (and then knocked out) down to a t. He will certainly be moaning about this new structure, if he isn’t right this second, especially if it results in our downfall. Regardless of Wenger or anyone else’s opinion though, it is formatted in this way. Pot 1 will consist of the Champions from the seven top leagues around Europe. These are considered to be the English, Spanish, German, French, Italian, Portuguese and Russian leagues. With the eighth spot being given to Holland. (It may be that this eighth country is up for change on a yearly basis). As usual, teams from the same country cannot face each other in this round. So Arsenal will be drawn against one of the Champions, which they are mostly used to having the benefit of avoiding. 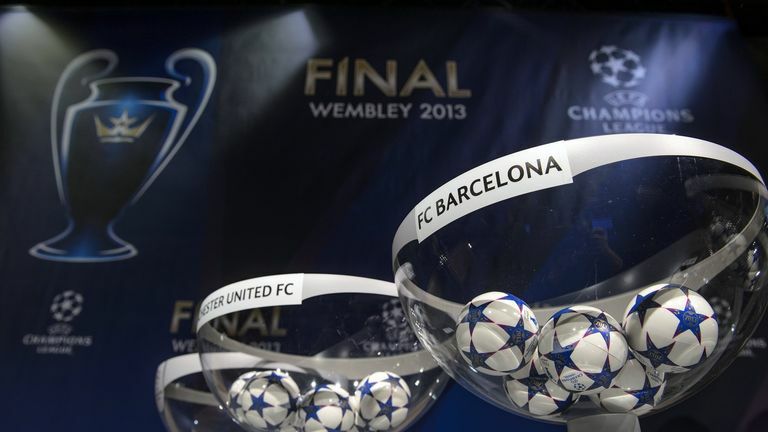 The Manchester clubs would have all of the same options for the draw as Arsenal too. While Chelsea could still be presented with a difficult team from Pot 2, with both Madrid’s amongst other top sides in there. In POT 2 with Arsenal, we have Manchester City, Real Madrid, Atletico Madrid, FC Porto, Valencia and two of Manchester United, Shaktar Donetsk, Bayer Leverkusen and Sevilla. In POT 3: Olympiakos, Galatasaray, Lyon, Dynamo Kiev, Roma, and 3 from Shakhtar Donetsk, Sevilla, Sporting Lisbon, CSKA Moscow, Lazio, Bruges, APOEL, BATE. And finally in POT 4: Borussia Monchengladbach, Wolfsburg, Dinamo Zagreb, Maccabi Tel Aviv, Gent, Malmo and 2 from APOEL, BATE, Partizan, Astana. The exact pots will be confirmed after tonights qualifiers, once we know who is through, it will also enable the teams to be ranked based on their UEFA Coefficient. This is why Shaktar Donetsk could be in pot 2 or 3 for example, despite having already qualified. Heading in to the second-leg of the Round of 16 tie between Arsenal and Bayern, the Gunners must overcome a 3-1 deficit at the Allianz Arena, Bayern Munich’s fortress. To qualify for the quarter-finals Arsenal would have to complete one of the most heroic comebacks in Champions League history, a fate the almost achieved at the same stage last year after losing 4-0 in the first leg, before winning the second 3-0. Although this task borders impossible against a formidable Bayern side who are one of the competitions favourites, not to mention that it has to be Arsenal’s weakest side under Wenger, the Bayern Munich players have insisted that Arsenal are not to be underestimated. Toni Kroos who scored the first goal at the Emirates has said that: “We should not be talking about the draw for the quarter-finals yet. We have the return against Arsenal first. We will have to secure progress before we can think about the outcome of the draw. “We have to be focused and cannot afford to underestimate Arsenal. They are a top team, as we all saw in the first leg. We have to put in another sovereign performance. Manuel Neuer has backed up Kroos, insisting that Bayern will approach the match with the right attitude. One of their midfield maestro’s will be missing through suspension, Bastian Schweinsteiger no less. But they have another in the form of Damien Martinez who they payed a fee of £35m for, twice Arsenal’s record transfer. Martinez told the Daily Star: “I think it will be an open match. Arsenal need a crazy game to create spaces on the pitch and score goals. We need to keep our heads and rely on our system. “We cannot think about what happened in the first match. “This Bayern squad has a winning mentality and our rivals fear us because we are serious contenders for the Champions League. “We need to concentrate for the full 90 minutes because to go out after leading 3-1 would be a huge blow for us.